This page was made on Dec 26, 2002 and describes the fist attempt at getting a completely free Eclipse running with the gcj stack. Since then all of the workarounds needed and bugs found have been fixed. There have been important milestones with respect to getting a completely native and furiously fast build working. And these days Eclipse (3) just works out of the box either interpreted or completely natively compiled without needing any patches to either gcj, GNU Classpath or eclipse. This page is here just for historical reasons. Eclipse is a nice free software tool for developing (java) software started by IBM. There was only one catch, it was build on top of the proprietary java platform. This made it useless for the Free Software community. Luckily the GNU project has two software projects that come to the rescue. GNU Classpath, core libraries for java, and gcj, the GNU Compiler for Java. We are now able to run Eclipse on a completely free platform! It is not yet complete, but you can already edit, compile and browse CVS with it. And since Eclipse uses GTK+ it also looks very nice. It is possible to run Eclipse with gcj since it comes with gij (GNU Interpreter for Java). It does take a little bit of work to get it running since you have to apply some patches to the latest gcj CVS verson. Hopefully the needed patches will make it into CVS soon. It is currently a bit slow (you will need a fast processor, 1Ghz+ recommended) and needs much memory (256MB recommended). And not everything will work yet (it sometimes hangs). But is already useful for gcj bug hunting and making pretty screenshots. It took much effort to get this far with our free java platform. And I want to thank all GNU Classpath and gcj hackers for their years of hacking to make this possible. In particular I want to thank Tom Tromey the main libgcj maintainer for his guidance. And for being the first person to get to the Eclipse Welcome Screen, after all his hacking the rest was easy. I should also mention Vincent Partington and Erwin Bolwidt for explaining why I should care about Eclipse and for their bughunting help last weekend. Please checkout their free software projects, Jaxup, formatjava and Sftp File Synchronization. How you can help: If you write free java software make sure it works well on the GNU platform and if you like hacking on low level stuff help us make Classpath and gcj even better. And please consider to "Join us now and share the software". The following pages explain how to patch gcj and setup Eclipse. 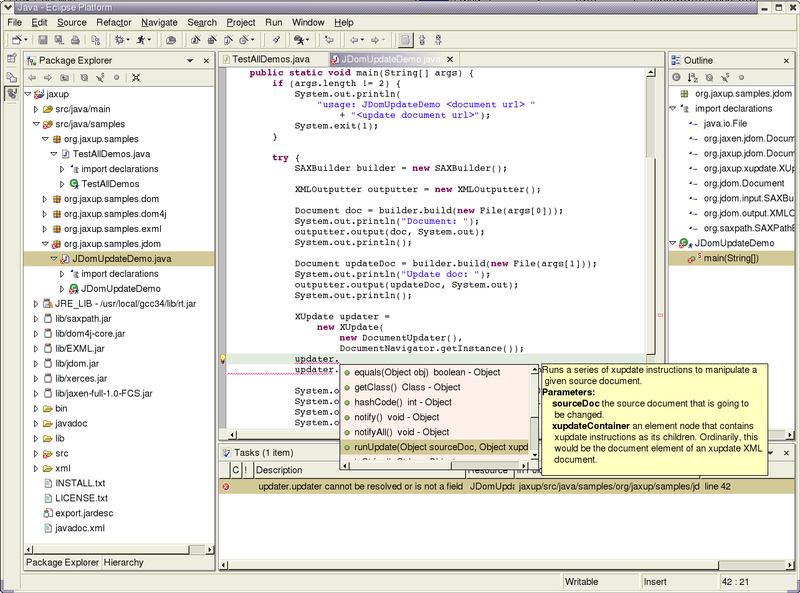 And show some pretty screenshots of Eclipse in action. Setup: Downloads, patches and file names.